The handsome Ellwanger Estate, former home of Rochester socialite Helen Ellwanger, wife of horticulturist George Ellwanger, sits in an historic and wealthy section of Rochester. First built as a farmhouse in 1817, and then purchased and enlarged by Ellwanger (co owner of Ellwanger and Barry Nurseries) in 1867 and 1910, staying here is an immersion into the wealthy lifestyle of the Victorian Age. The gardens, as one would imagine, are beautiful. 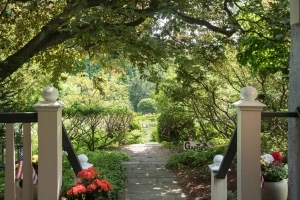 Owner, Rosemary Janofsky, purchased the estate in 2006 (it was previously operating as an inn), and has lovingly preserved it. In 2008, as a “Designer ShowHouse” fundraiser for the Rochester Philharmonic Orchestra, guest rooms were used as fresh canvasses for interior designers, so each offers a unique and posh experience. Who stays here? Business travelers, honeymooners, romantic couples, parents visiting U of Rochester students, and anyone who favors sleeping on firm organic mattresses. And, if a television film crew is in town, chances are they choose to stay here.